Happy New Year, lovelies! With the new year and month, comes our first Leading Lady of 2017. I think you will love our January Leading Lady, Stephanie Klauck! Hailing from our northern neighbor, Canada, Stephanie is a wife, mother along with being a gifted cardmaker who is one the design team members of My Favorite Things. You can find her fabulous works of art on her blog, Round Here. With her clean and simple approach with dramatic punches of sparkle, color and texture she's sure to inspire you. For those of you who are long-time follower of the w&w blog you will know she has been a guest with us before. You can find some of her awesome cards HERE. Today she has an adorable card with a video tutorial that will motivate you to try something new or remind you to do something you haven't for a while. Please give Stephanie a big round of applause to welcome her as she steps onto the stage for her first performance as our January Leading Lady! Hello, it's Stephanie here and I am thrilled to be here on the Winnie and Walter blog every Saturday for the month of January! For today's card, I wanted to share a fun way to create a textured window scene by creating a small background area and then heat embossing it. To create the texture in the window opening, I stamped the Mini Scenery: Marbelize onto a white cardstock panel with Black Onyx Versafine ink and then I heat embossed over it with clear embossing powder. Once it was embossed, I added some colour with Peacock Feathers Distress ink. I cut a small rectangle window out of a second white cardstock panel measuring 4" x 5 1/4" and then adhered it over the trimmed down embossed piece with foam adhesive to create a dimensional window area. I adhered the finished panel to a black top-folding card base and then I diecut the word Wishes from silver sparkle cardstock and adhered it directly over the window, making sure to add foam adhesive to the center of the word to help support it. I stamped and coloured in the owl from the Happy Owlidays stamp set and then I stamped the word 'warm' on his belly. I diecut him and then adhered him onto the diecut word to make it look like he was sitting on top. What a cool card!! That background is amazing and the little owl is so sweet!! Love that background and the pretty sentiment! Darling owl! Wonderful design with the window over the embossed panel. Really cute card and dazzling with that sparkling sentiment!!! LOVE this card, and so happy to see Stephanie as this month's leading lady!!! Fabulous card! I love Stephanie's style! So inspiring! Very cute with this owl and I like the marbelized background and the glittery sentiment. Awesome video Stephanie and equally awesome card! So adorable! Love the inky blue background & that awesome silver sentiment!! I've never made a window with a heat embossed element inside! This is a great idea that I will remember! I also love the owl with the word "warm" stamped on his tummy to complete the "warm wishes" sentiment! Looking forward to seeing your creations for the rest of the month!! Lovely card and looking forward to your January creations! Beautiful card, love this design and that super cute owl! Stephanie I'm thrilled to see you as a Leading Lady!! Congrats ... LOve this little fellow, and you've given him the loveliest perch! Soooo Sweet!! Love the colors!! 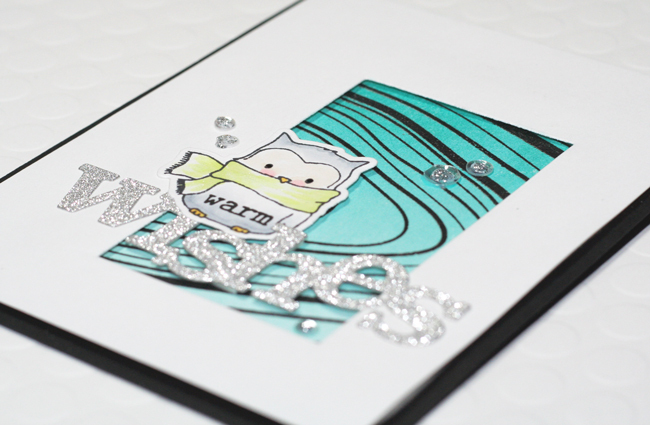 I always enjoy your MFT cards & now you've worked your magic with W&W! I LOVE the owl! This is so cute and you make it look so easy! Have a warm and wonderful 2017! Very cute card...love the ombre window. Congrats on being Leading Lady this month! I love that new marble background stamp and the owl is the cutest!